Gharkey St. Motel are recordings and demos from Martin's early days in the pubs, vans and places they called home. Mike Martin has been compared to Dylan, Cash and Woody Guthrie but one listen will give you proof that Martin is an American original. Gharkey St. Motel is collection of early recordings and demos from Martin and a host of working musicians from early days in the pubs, vans and places they called home. In the baptism by fire approach to the road Martin and his band The Beautiful Mess is like when Neil Young joined forces with Crazy Horse, or when Tom Petty met The Heart Breakers. They've been out on the road stump jumping and cutting their teeth on the neon signs. 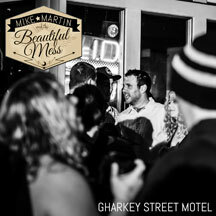 This collection of material is a reflective look at Mike Martin's songwriting from the last decade, and a look to the future of The Beautiful Mess.